Your survival is dependent on protecting two vessels - they are devices in sync, a dance and song between two entities tethered together in symbiosis. Feel edge of your seat terror where the world around you becomes quiet and numb as all that matters is the game -- that is Duet. With air tight controls and gameplay tuned to perfection, Duet provides the perfect balance between challenge and pure gaming satisfaction. Turn left and right to twist your vessels and avoid everything in your path. Remember: even that which begins simple can end complex. Experience nine chapters of deceptive narrative and nerve-twisting gameplay. Replay any stage to perfect your movements and unlock over 50 achievements. This is a game that will test you. Explore a whole new narrative with all-new game mechanics in the Epilogue. Including over 40 stages, narrative and remix tracks, You will need a new state of mind to complete this experience. 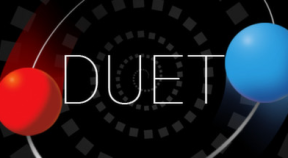 Still can’t get enough Duet? Discover even more mind-bending challenges with the Encore Chapters. Compete on the leaderboards in the Endless Mode, Epliogue Endless Mode and Encore Endless Mode. Hone your reflexes with the Speed Run Mode. An outstanding handcrafted soundtrack by Melbourne composer and Gotye multi-instrumentalist Tim Shiel. Eighteen unique and mesmerizingly beautiful compositions ensure an immersive experience for you at every step of your journey, complemented by full in-game vocal narration by Jojo Petrina.